If you’re going to put out the energy and time to cut, split, and properly store firewood, you want to know you’re being as efficient as possible. No use wasting valuable time when there might be an easier way, right? 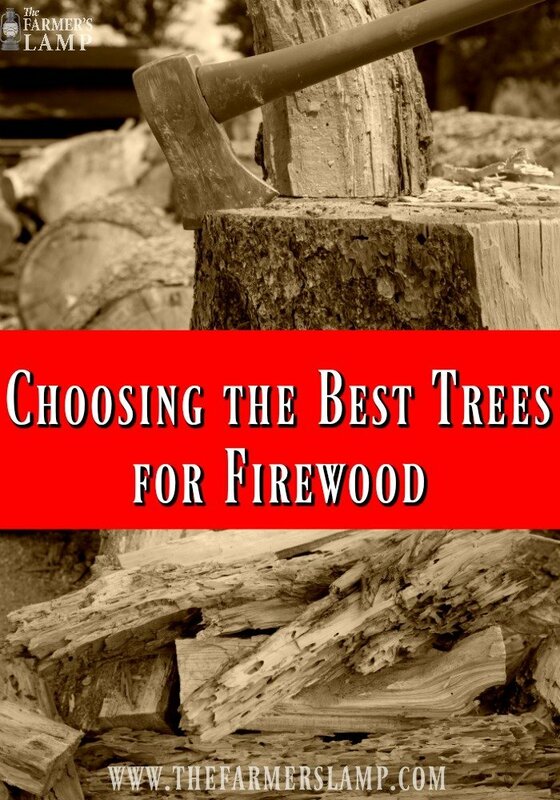 The question is, how do you know which are the best trees for firewood. Some People say it doesn’t matter what kind of wood you burn in a wood stove or furnace as long as it is seasoned properly. While properly seasoned firewood is a huge factor in how wood performs, there are other factors to consider. From what I have experienced and was taught by my grandfather, one of the things you also must consider is what type of wood will meet a particular need. He was a logger before he was married and logged, as well as farmed, most all his life. He broke his leg in a logging accident when I was about 9 and didn’t log anymore. You may be cooking on a wood stove, heating the house with a wood burner or using wood stove water heat exchange. You should know, not all wood is created equal for every task on the homestead. So what makes the best trees for firewood? The answer depends on where you live and what you have available in your region of the world. In some regions, you have an abundant supply of hardwood. In other areas, there’s a greater supply of softwoods. There are some facts which apply no matter where you live or what your wood needs are. Everyone seems to agree that seasoned wood will always out perform green or snag wood as it’s called. It’s always important to remember the ideal moisture content of cured wood is below 20% in your split firewood. Some people use a moisture meter to know when the right moisture level is reached. Wood that has not been seasoned for at least a year is often hard to light and may keep going out. It will smolder and won’t put out much heat. It just generally burns poorly. The moisture in green wood causes most of the creosote to build up at an alarming rate. The faster the creosote builds up in your chimney the more often you must clean out the stove and chimney. Frequent cleaning can prevent a fire from starting in the pipe and burning your roof or home. Wet wood causes the whole system to be inefficient. Dry wood, on the other hand, produces a hot fire. Which in turn makes a hot flue, and a hot flue means much less creosote buildup. If you purchase your firewood, you want to be sure the wood you’re buying has been seasoned for at least a year and stored in a way which prevents moisture from soaking in every time it rains. Seasoned wood looks dark, or gray when compared to the green wood of the same kind. When you split it, you will find it brittle with cracks running through each piece. Softwoods, when properly stored, should be dry enough after one year to burn efficiently. However, we have found one year is not enough for hardwoods to produce the most efficient heat. 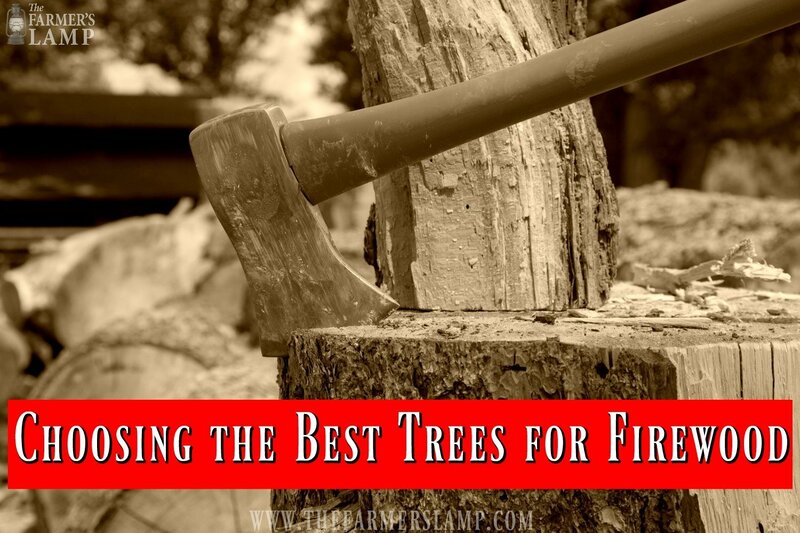 Which are the best trees for firewood for you? If you only use firewood a few times a year you may want to go with dry softwood like fir. It takes less time to dry and has a wonderful fragrance which creates a lovely ambiance. You’ll find it easy to light and split. The downside of fir and other softwoods is they don’t burn as long as most hardwoods. This means you’ll have to feed the fire more frequently. If you use wood as your main source of heat, you may want to try hardwoods. A stove loaded with oak at bedtime can still be going when you get up in the morning. You may pay more per cord for hardwoods. I’ve seen it $300 a cord of Oak compared to $225-$250 for a cord of softwood. The Oak is denser, so you get a little more bang for your heating buck in the long run. The best course of action, in my opinion, is to have some softwood split very small like four inches in diameter to use for kindling and hardwood to put on top to catch and continue to burn to produce the best BTU’s for your heating needs. This gives you an easy-to-start fire which will continue to produce long-lasting heat and a bed of coals for many hours. Depending on the efficiency of your wood burner and how much air you put to the fire, you can have a bed of coals for a couple of days. Where I grew up there were plenty of trees. There were pines, oaks, hickory, red and silver maples, and cedars just to name a few. I learned to be a steward of the land and not just a consumer. This meant replanting trees when you harvested wood. My great-grandfather used practically all the cedars on his farm to make fence posts, wooden gates, and outbuildings. Just last year some of his posts could still be seen along fence rows. The problem was, he didn’t replant. There are only a few small cedars on that farm now. My grandfather built his barn, hay barn, chicken coops, garage, most anything he needed from pine and oak. They grew all around us and he was careful about the age and location of the trees he harvested. He had to move his syrup mill and sugar cane plot for crop rotation. To do this, he cleared an area, removing and using the trees. I remember helping him plant the old section in new trees. Of course, he’s gone now, but the trees are there, large and strong. Is there a particular type of tree in your region which makes the best trees for firewood? Do you have experience harvesting firewood? Please share your experience with us.